Starter is a 4-pole, 4-brush type direct series wound motor. The engagement mechanism is integral with the starter and controls switching on and off of motor and shifting of the starter pinion. Fig. 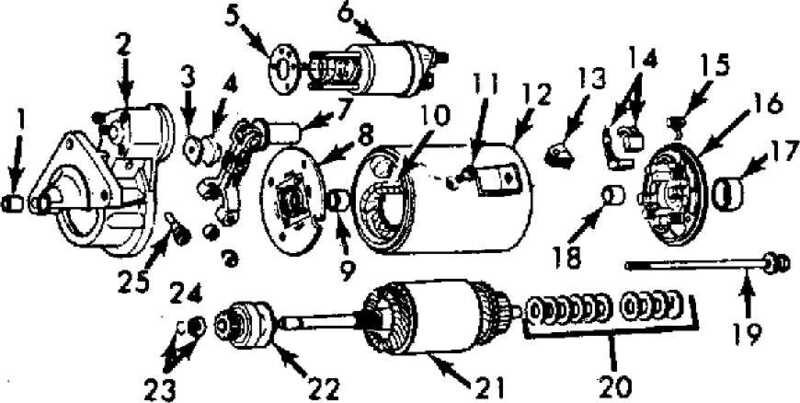 1: Exploded View of Paris-Rhone Starter Motor Courtesy of Chrysler Motors. of the starter relay to ground. contacts. With start relay contacts closed, battery voltage is applied to starter solenoid. Both solenoid windings are energized. plunger also closes solenoid switch contacts in the starter solenoid. NOTE: Use the amperage draw reading after the starter motor has obtained its maximum RPM. Check the battery for a broken or cracked casing. or too low may cause poor starter motor performance. each cell with a hydrometer. NOTE: No further testing or troubleshooting procedures available from manufacturer.